Click here for Prof Kirsteen McCue’s Blog on the 2018 Jolly Beggars event at the British Library! 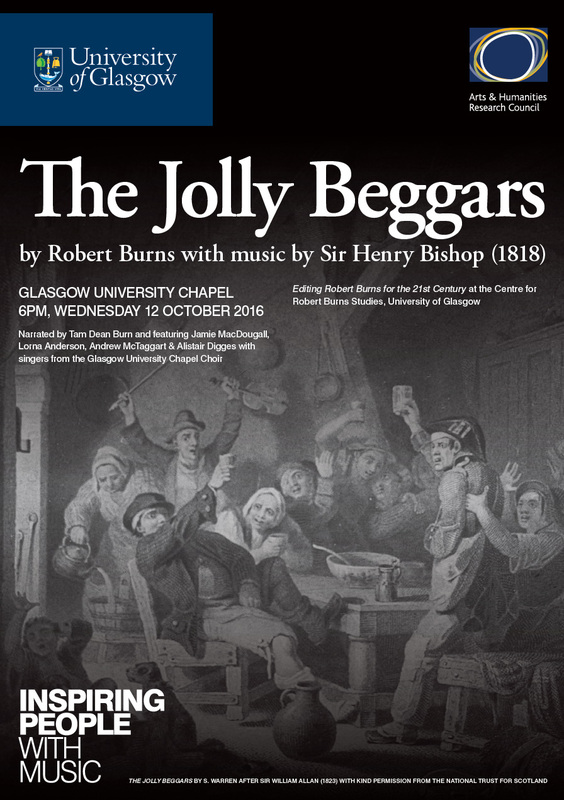 The performance of Burns’s cantata ‘The Jolly Beggars’ that you can see here is a live recording of a performance held in the Chapel at the University of Glasgow on 12 October 2016. The performance used the first edition of the piece to appear with both text and music in George Thomson’s Select Collection of Original Scottish Airs (volume 5) published in 1818. Our new edition of this piece is part of the forthcoming volume Robert Burns’s songs for George Thomson, edited by Kirsteen McCue, as part of the Oxford Collected Works of Robert Burns. We’d like to thank all the performers who agreed to take part, and the University Chaplain, Stuart McQuarrie, for permission to hold the performance in the Chapel. Burns wrote ‘Love and Liberty: A Cantata’, also known as ‘The Jolly Beggars’, around 1785. It was never published during his lifetime, possibly due to its controversial political and sexual content. Burns set out to capture, in all their glory, the lives of a set of Ayrshire vagrants drinking one night in Poosie Nansie’s tavern in Mauchline. Burns did think about publishing it in the 1780s, but was dissuaded from doing so. Some thought it might have ruined the favourable reception he had received on the publication of his first collection of poems in 1786. When the Edinburgh song editor, George Thomson, first mentioned it in a letter to Burns in 1793, the poet claimed to have forgotten all about it. Burns died in 1796 and his cantata eventually appeared in print in 1799 in chapbook form, published (or rather pirated!) by Stewart and Meikle of Glasgow. It was not included in the first collected works of the poet, edited by Dr James Currie in 1800, but did appear in a number of other collections of the poet’s work across the next decade. In 1818, when George Thomson decided to include it in the fifth volume of his Select Collection of Original Scottish Airs, he made a comment about its exclusion from Currie’s edition and drew attention to the need to revisit the work by quoting verbatim from an article in The Quarterly Review. This anonymous article claimed that ‘The Jolly Beggars’ was one ‘of the Bard’s most spirited and happy effusions’ and that ‘such a collection of humorous lyrics, connected by vivid poetical description, is not, perhaps, to be paralleled in the English language’. This article was, in fact, written by Thomson’s colleague Walter Scott, whose authority helped Thomson make the case for his own decision to publish the work. 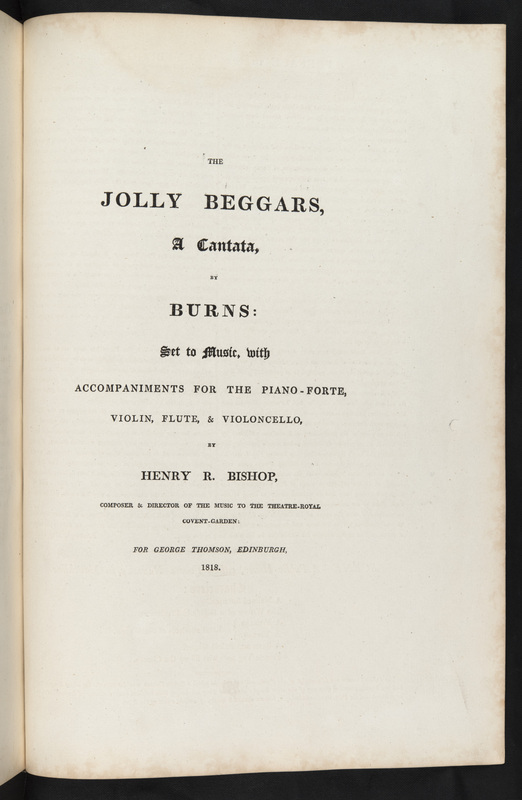 As far as we’ve been able to ascertain, Thomson’s was the first publication of ‘The Jolly Beggars’ to include both text and music. While he commissioned musical arrangements mostly from continental European musicians, on this occasion Thomson approached the English theatre composer, Henry Bishop (1786-1855), to set Burns’s text, sending him specific tunes for the songs and otherwise allowing him freedom to produce his score. Now famous for the song ‘Home, Sweet Home’, Bishop was knowledgeable about music from all corners of the British Isles and also set songs by Walter Scott and James Hogg. 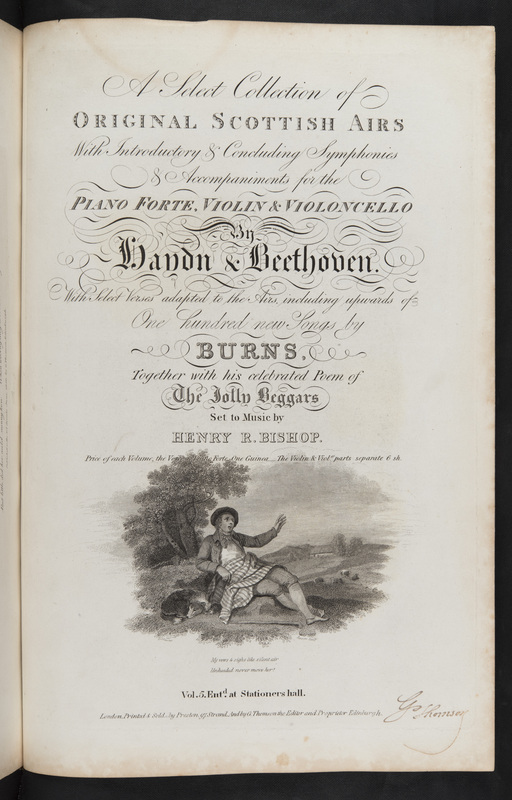 Thomson’s title page advertises a flute part in addition to parts for piano-forte, violino and violoncello, but we have been unable to find either a manuscript or printed flute part. Even the string parts are rare, and we are most grateful to the Burns Monument Centre in Kilmarnock (East Ayrshire Council) for allowing us to use their copies for this performance. Thomson, an editor keen to tinker with everything he published, did make some changes to Burns’s text, notably omitting ‘I once was a Maid’ sung by the prostitute to the tune ‘The Sodger Laddie’ and omitting the ‘Merry Andrew’ song, that had been included in both manuscript and some printed versions of the cantata. He also changed some other lines and words. His introduction shows his clear concern over the content of the work, but he emphasises that he has tried to change as little as possible – simply amending to adhere to his own levels of decorum. The most notable of these edits must surely be his decision to change the line in the final chorus from ‘Churches built to please the priest’ to ‘Jails, to be our scorn and jest’. Most of the items in Thomson’s collections went through various reprints and amendments, but ‘The Jolly Beggars’ is unusual in only having been printed once. This, as well as the length and provocative tone of the cantata (even following Thomson’s changes it remains among his raciest items) grant it a special status. It is a fascinating work; treated ambiguously by Burns, handled with nervous delicacy by Thomson, but now considered among the very finest productions of the poet. While we’ve found a review of an early performance of the work, in Leith in 1819, as well as a late nineteenth-century singing edition of the piece, we have found no references at all to any modern performances of the cantata as you hear it in this recording.